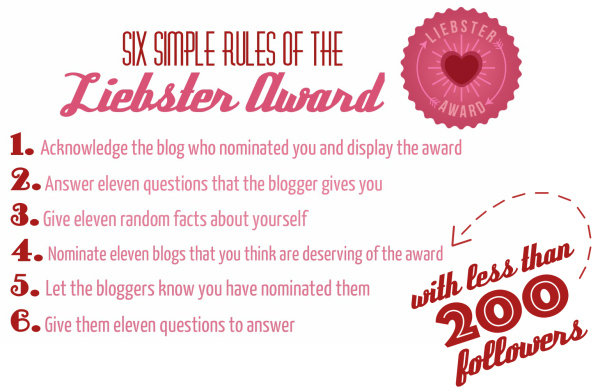 Adae To Remember: I Was Nominated For Liebster Award!! I was not so aware of this..something new it is! Thanks to Jesma of http://truefalsemaybe.blogspot.com/! Hope I can answer your questions well... I hope you'll enjoy this. Because I did! 1. If you will be given $10 million dollars what will you do with the money? I'll save a little and spend the rest to the people I love or who are in need. 2. If you can have a super power what would it be and why? I want to have the power to change people's bad attitude. Picking my nose every 1st thing in the morning when I go to the washroom. 4. Who came first? the chicken or the egg? Defend your answer! 5. What question do you hate to answer? Are you happy? Not, that I am not happy. I just feel like it's a question that can make you suddenly pause and think. 6. Do you believe in ghost? Have you ever seen one? 7.What is the weirdest thing that ever happened to you that you cannot explain? 8.What do you think is the most useless subject in school? Nothing. It's all useful the way I see it. Except the minor subjects in college that is not related to your course. 9.What is the one, single food that you would never give up? 11.If you could marry a fictional character, who would it be and why? Don't want to be married again! waaahhh! 1. My real name is RONADEL. 2. I love Richarde Gere. 3. My daughter is the greatest blessing in my life. 4. I have been married for 8 years already. 5. People thought that I wear branded stuff, Nah, I am a cheapskates. 6. 105.1 Cross Over is my radio station while driving. 7. Purple is my favorite color. 8. I love to sing but singing never loved me back. 9. I also love to cook. 10. I don't mingle with people who has a serious attitude problem. 11. I love to give! This time i would like to nominate some bloggers who I think deserves to get this challenge. 1. Garden wedding or Beach wedding? 2. If you had to run a business, what would it be? 3. If you had to be in a reality t.v. show, which would you choose? 4. Would you rather be a rock star or a super hero? 5. Duterte or Miriam for President? 6. What is your most unforgettable act of kindness that you will always remember? 7. What's the bravest thing you've ever done? 8. Whose love would you like to emulate? 9. What is the greatest thing you've ever done to your parents? 11. How much do you love God?